I can hear your comments and questions even now. How dare I even speak of possibly doing Steampunk projects without the holy item that is gears? Let’s be honest, you look up Steampunk online and you are bombarded with images of things with gears and cog works. Don’t believe me? Go ahead, look it up, I will wait here. So then the real question is, is it possible to actually do Steampunk without gears? I am not sure but I am going to give it a good go. I, too, remember starting out in this whole Steampunk thing believing that I had to throw gears on whatever project I was working on. It was gearspalooza. Gears here. Gears there. There was a shower of gears over everything. In my mind something couldn’t be seen as Steampunk unless there was gears all over the thing. After a while my creative mind began to reject all the gears. Holy crap on a candle stick, you can only throw gears on something so many times before you realize that you are no longer being creative but are merely repeating the same thing over and over again. Not to mention, if you get your crafting supplies from your local crafting store like I do, there isn’t much of a variety in gears and cog works. So it was time for me to sit down and begin to really thing about what Steampunk means to me. Yes, I said it; what Steampunk means to me. To me, Steampunk is all about showing your own creativity. It’s about turning something beat up and worn or taking something new and making it old with your own personal twist into some beautiful masterpiece that would make others ooooh in pure jealousy. It is about embracing the Victorian desire to create and explore. I am not sure if I explained it properly but I did give it a good go. Please feel free to write me an angry comment about how I got it wrong. I may even agree with you. When I sat down to think of what I wanted each room’s theme to be, yeah each room has a theme which I will discuss later on but not today, I thought about how to use that Victorian need for exploration and creation. Each room may not be Victorian Steampunk but it has that idea behind it. 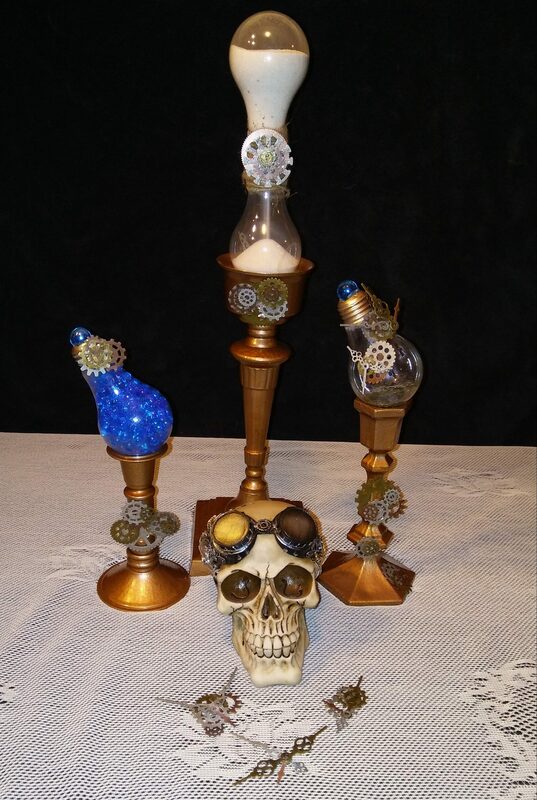 I thought about what each project should be and how I could make it Steampunk without throwing on gears, I’ll show you and example later with my first project I will be posting. I am not say NOT to use gears, I am just saying not to use them too much. Think outside the box. Read. Research and think about what your goal is and what you are trying to achieve. Be creative and don’t rely on those easy to use gears too much.